Sony Xperia Z from the Japanese grand aims to be biggest rising android smartphone made from Sony challenging its competence with the other top-tier smartphones here like iPhone 5, LG Nexus 4 and the Samsung Galaxy S3. It’s certainly well looked Xperia jam-packed with features, power, looks and connectivity to offer the best android experience to any android user. It definitely has an appealing design, but the lack of Android 4.2 at launch is quite unfortunate. A smartphone under its graceful design must have the prerequisites of a powerful hardware, fast and responsive software experience, latest operating system, high resolution camera and the enhancements for the software to be ready to fix any software mess up. Sony smartphones, especially Xperia series had quite followed these basic things to provide users much advanced android interfaces with better technologies and be at par with other in-line species of its kind till now, but now the Xperia Z from Sony is here to try and overpower dominant ones even the upcoming Samsung Galaxy S4. The specs sheet is far too strong like there’s a 1.5GHz quad-core processor, 2GB of RAM, 13.1-megapixel camera, 4G cellular connectivity and 16GB built-in storage which can be augmented using microSD cards. All these nice edge cutting tech is protected by case design that can survive a dip in water up to the depth of 1 metre for 30 minutes. And it’s dustproof as well. Encased in a beautiful glass body with the back panel being a glassy design instead of the soft touch plastic making it less slippery too. Xperia Z is a super-thin smartphone with only 7.9mm thickness, but not as thin as you would feel uncomfortable in your hands. Sharp edges cover the shape. 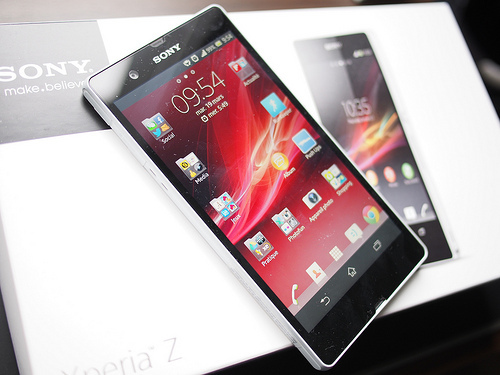 Sony Xperia Z has a rough release date in the 1st quarter of 2013 is now expected to come nearly by 1st March 2013. In INDIA, it prices around Rs.35000. In the United States, it prices around $869. Expansys – £399, updated to £529 on 16 January. This article was published in Technology and tagged Mobile Phones, Sony. My relatives every time say that I am wasting my time here at net, except I know I am getting experience everyday by reading such nice posts.